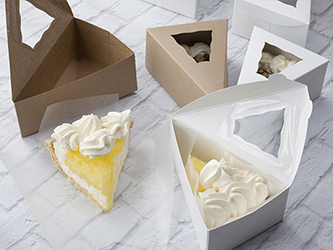 Purchase Pie Slice Boxes to Spotlight Your Slices! Pie slice boxes are the perfect packaging to protect and present your single slice of heaven. These paperboard triangles have a window for your dessert fans to spy the pie waiting for them just under the lid. The cardboard pie slice boxes ship flat, are easy to set up, don�t take up much space to store, and add professional polish to each parcel of pie. Here is a link to a template to help you cut a tailored liner for this pie slice packaging. Box Maker Nate developed this structure for individual pie slice boxes with the help and testing of wonderful pie artisans who asked BRP to build a better pie slice box. Don�t forget to visit our flavor stickers page to use on these pie wedge boxes and our other pie boxes too!